Lucky is the homeowner who finds hardwood floors under carpet or linoleum. These wood floors can often be restored and refinished to their original luster, adding value and beauty to the home. Few old wood floors are in pristine condition, though. Pet stains, oil stains and other alkaline substances leave dark marks on the floor. Some stains, such as pet stains, leave behind odors, as well. Dark spots but may actually be worn areas rather than stains. Occasionally a floor may not need complete renovation, but only a good cleaning and a few minor repairs. 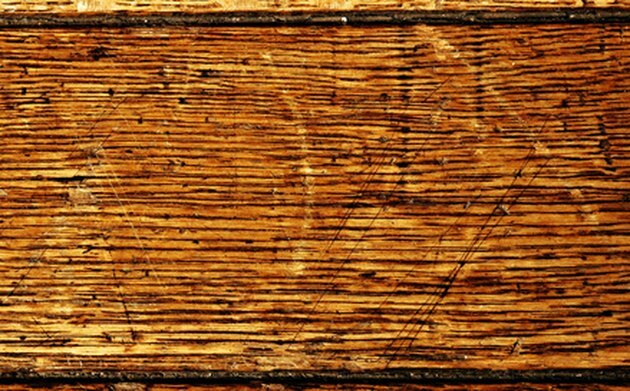 Old wood floors often have a warm patina lacking in new flooring. Spray white vinegar on the stain and allow it to sit for three to four minutes. The acid in the vinegar interacts with the alkaline substance, breaking it down and emulsifying it. Wipe the floor clean with a damp cloth and allow it to dry. Re-apply the white vinegar three or four times as described above to remove stains. Apply wax to scratches or worn areas of the floor with a piece of very fine steel wool. Rub gently, following the grain of the wood, until the waxed area blends with the surrounding wood and hides the marred surface. Remove any remaining wax with a clean cloth.